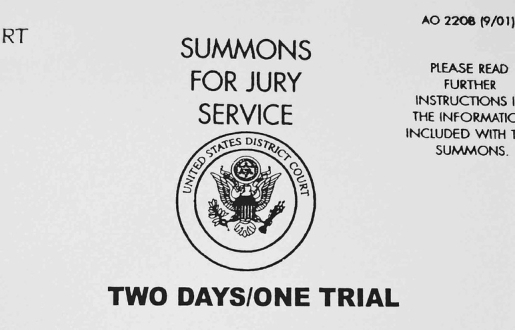 When Timothy Michael Jones got a summons for jury duty, he was less than happy. When he filled out the card and returned it, he made sure to express his displeasure using as much profanity and dirty language as possible. Rather than getting him out of his duty, it got him a bench warrant issued. When he didn’t show up, that bench warrant became contempt of court, and now he’s facing jail time and fines, all for expressing himself colorfully! Why Jones didn’t show up before Yuma County Superior Court Judge Andrew Gould, nobody knows. Why he was so angry about having to serve jury duty, I’ll never know. I mean, I’ve done jury duty before. I even got on a court case! Yes, it was very boring to sit around for hours at a time, but I got a lot of reading done and was able to work on some stuff in the jury lobby, assuming I wasn’t too late to get a power outlet for my laptop. There’s a lot worse ways to spend a few days.